"ScreenItAgain is the internet's best source for custom replacement window screens, door screens and window grilles. We offer a simple step-by-step approach to ordering custom window screens and grilles. With the largest variety of colors, profiles, and sizes online you can easily find what you're looking for! Each of our custom replacement window screens, door screens, and window grilles are made according to your specifications, so you can enjoy the right fit every time. Your home isn't just your castle, it's a fortress. Our replacement window screens protect you and your family from mosquitoes, flies, temperature extremes and other threats to your safety and comfort. Don't put up with the frustration and inconvenience of damaged or broken window screens and door screens. ScreenItAgain and get maximum enjoyment from your home! For a limited time, we're offering four Christmas-themed screen prints! Your options include: Christmas Tree, Santa Claus, Wreath, or Snowman. The intuitive design of ScreenItAgain.com makes it easy to order a custom window screen to fit exact window dimensions. Our holiday screens are printed proportionately to the size of the screen. 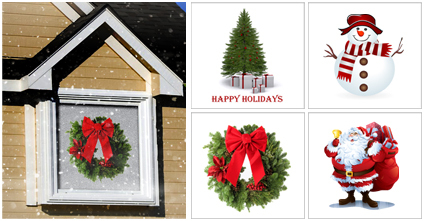 These screens are imprinted with your choice of holiday design on premium white mesh." What we thought: Our screen looks fantastic! The ordering process couldn't have been easier. There are just a few steps and as long as you know your measurements, you are golden! Shipping was super fast and our screen is really great. We have gotten so many compliments from our neighbors and even had someone knock on our door to ask where we got it! It is a simple way to show off our holiday spirit and doesn't involve getting out the ladder and increasing our electric bill:) ABCD Diaries gives ScreenItAgain.com an A+! Buy It: If you are looking to replace a screen or want to add a festive screen to your holiday home decor, check out ScreenItAgain.com! Hi there it's me, I am also visiting this website regularly, this web page is truly pleasant and the users are actually sharing nice thoughts.